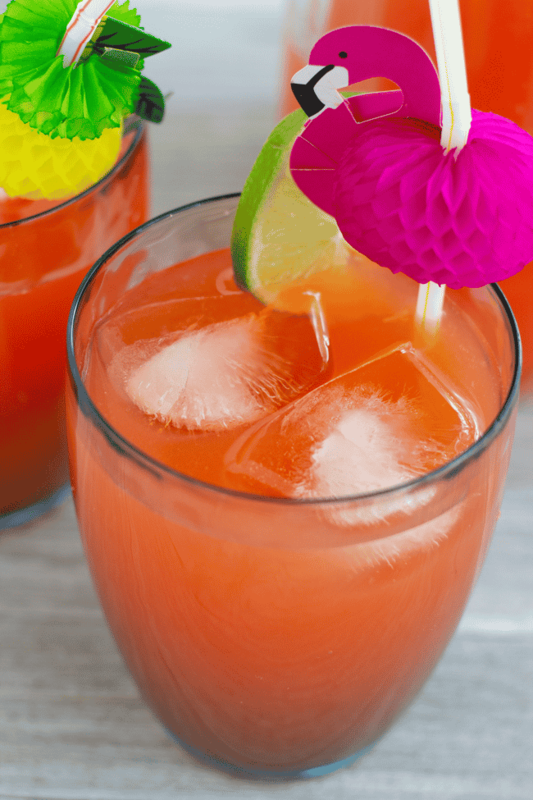 This Jamaican Rum Punch Recipe is the perfect drink for the summer. It’s delicious and refreshing and the perfect drink to bring you to the Caribbean. This post is meant for an audience 21 and over. This post may contain affiliate links, please read my full disclosure here. Oh Jamaica! Jamaica! How I miss thee! I’ve got to say that I loveed growing up in a Jamaican household and I love everything about Jamaica, especially the food! Which is why I really should share more Jamaican recipes with you all. Noted! More Caribbean recipes to come in the future and will be added to my Carribean recipes page. But for now, I must share this Jamaican rum punch recipe with you. So what’s in a Jamaican Rum Punch? My secret ingredient of…sparkling wine! I’d probably add sparkling wine to any punch I make because I’m a huge fan. This recipe is delish with or without it but I find that it lightens it up a bit. So what kind of rum you may ask? I like to use Jamaican Appelton Rum in mine. I find that it doesn’t overpower the flavors. No worries if you can’t find Appelton, any dark rum will do. Hubby has taught me (he used to be a bartender) that a drink should not taste like straight liquor. Well my friends, this drink does not and it is super delicious. This drink is perfect for a crowd and super easy to prepare. 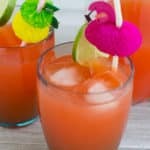 Serve this Jamaican rum punch with these cute little flamingo and pineapple straws for a real Caribbean feel. This Jamaican Rum punch is the perfect summer drink. 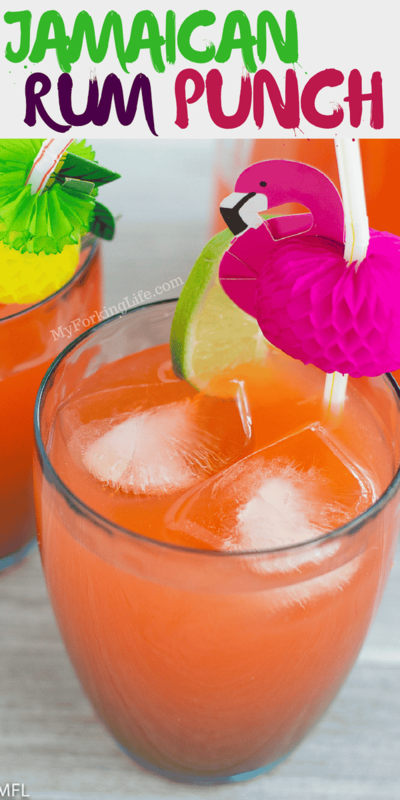 Enjoy the taste of the Caribbean with this authentic rum punch recipe.
. Grenadine or Strawberry flavored syrup would work as well. Looking for more Jamaicain recipes??? 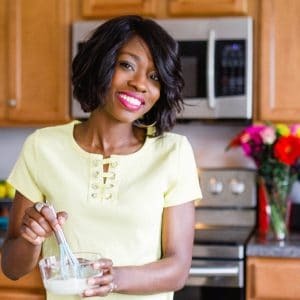 Head over to the Recipe Category of Caribbean or try my Corned Beef and Cabbage and Callaloo and Saltfish recipes. Wray &nephew white rum and a lil ginger for authenticity. One of the best decisions that ever made was to purchase this Air Fryer. I waited and thought and price shopped for months until I finally understood from reading how to get the most use from this fryer. I can honestly say that I have not had my oven on in weeks and we totally like the texture of the many things we have placed in the fryer. A great purchase!! I’m not sure I’ve ever had a rum punch. It sounds fantastic – perfect for sipping in the summer! Sounds like the sort of drink that’s perfect nice and cold at a summer party! My favorite summer drink! I love how festive it looks, too. This brings me back to spring vacations! I love this stuff but I’ve never tried making it home. Can’t wait to try it out!